Preheat oven to 180C. Grease tin and line the base and sides with a collar of baking paper that extends 2 cm above the top of the tin. 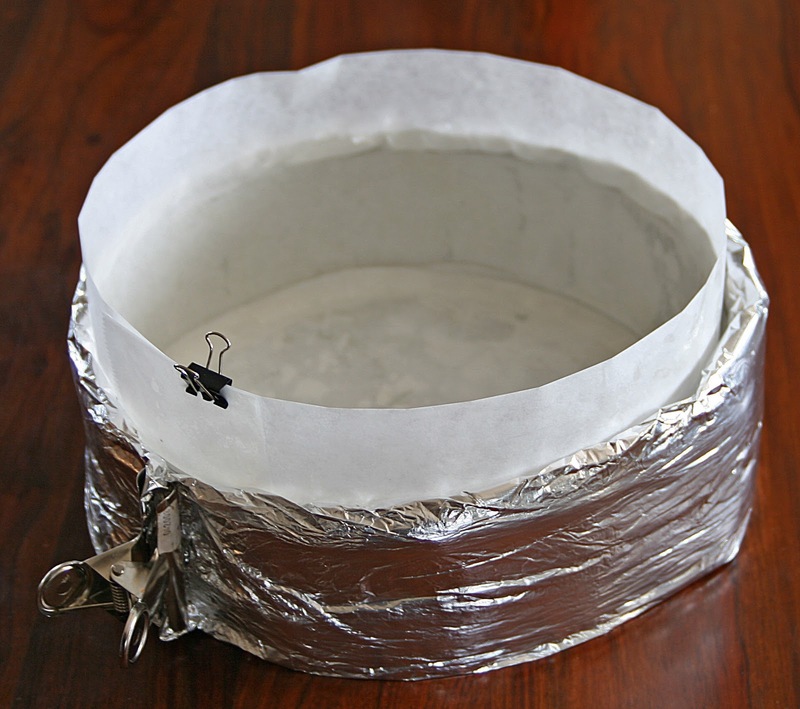 Add baking strips (made from damp cloths wrapped in tin foil) around the outside of the cake tin. Put the butter and water in a saucepan over medium heat and stir until butter has melted. Turn off the heat, then add the chocolate and stir until it has melted and is well combined. Sift the flours together in a bowl. Add the sugars, a pinch of salt and make a well in the centre. Pour into the cake tin inserting a flower nail in the bottom of the tin. Bake for 1 hour 20 minutes or until the cake is golden brown and a skewer comes out clean when poked into the middle of the cake. Cover with foil halfway through if the cake is browning too quickly. Once removed from the oven, use a pastry brush (or similar) to brush the top of the cake with boiled water to keep it moist and save it from cracking and forming crusty bits on top. Then cover with a clean tea cloth to reduce evaporation. Repeat the brushing with boiled water step two or three times at half hour intervals as the cake cools. Remove the baking strips once they can be handled or use oven gloves to remove them. Let cake cool completely on a wire rack before taking the cake out of the tin. Wrap the cake well in cling film (do not squash cake) and put in fridge till morning. To make the teddy. 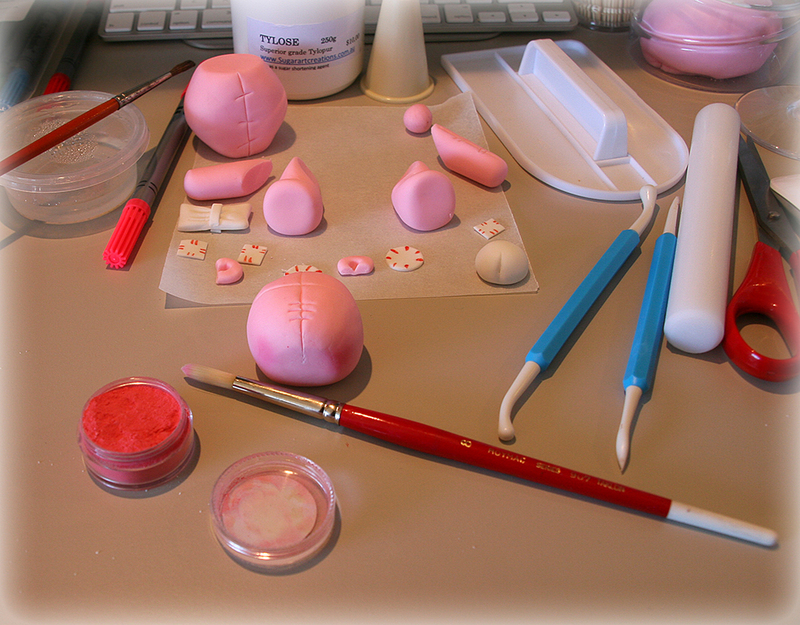 Colour white ready made sugar paste with pink gel colour and add half a teaspoon of Tylose powder and kneed till incorporated. Model all the little bits and pieces in the picture above and leave to harden for an hour or two. 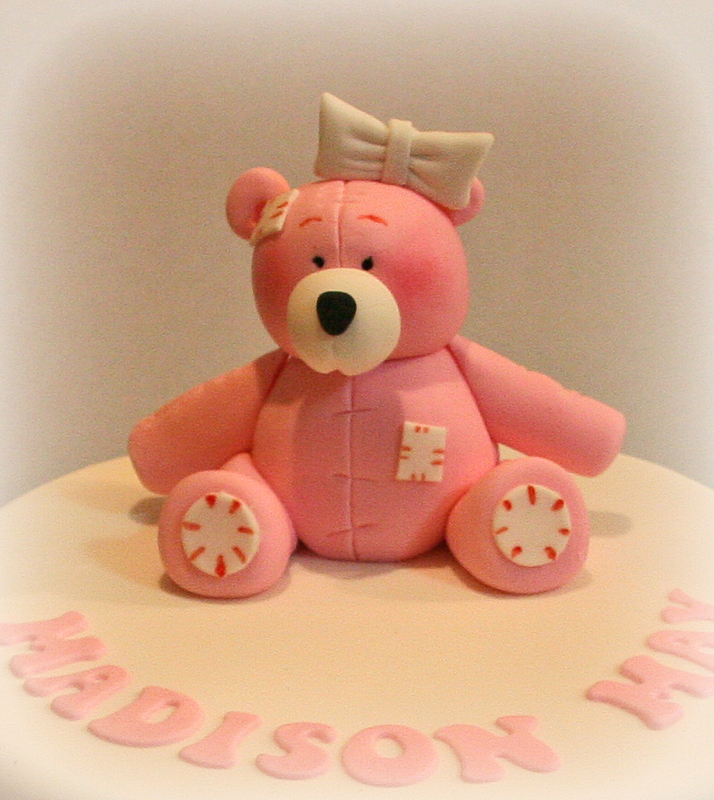 Use dark pink petal dust to brush onto the Teddy’s cheeks with a dry paint brush. Use wooden cocktail sticks to attach arms, legs and head to body along with edible glue made from water and Tylose powder. 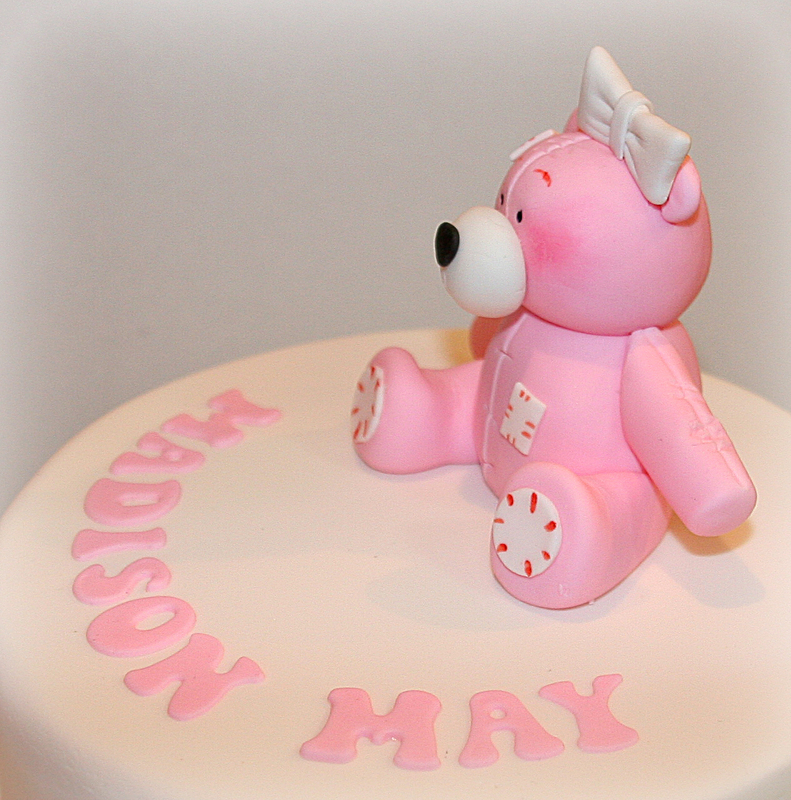 Use the same method to attach the finished Teddy to the cake. 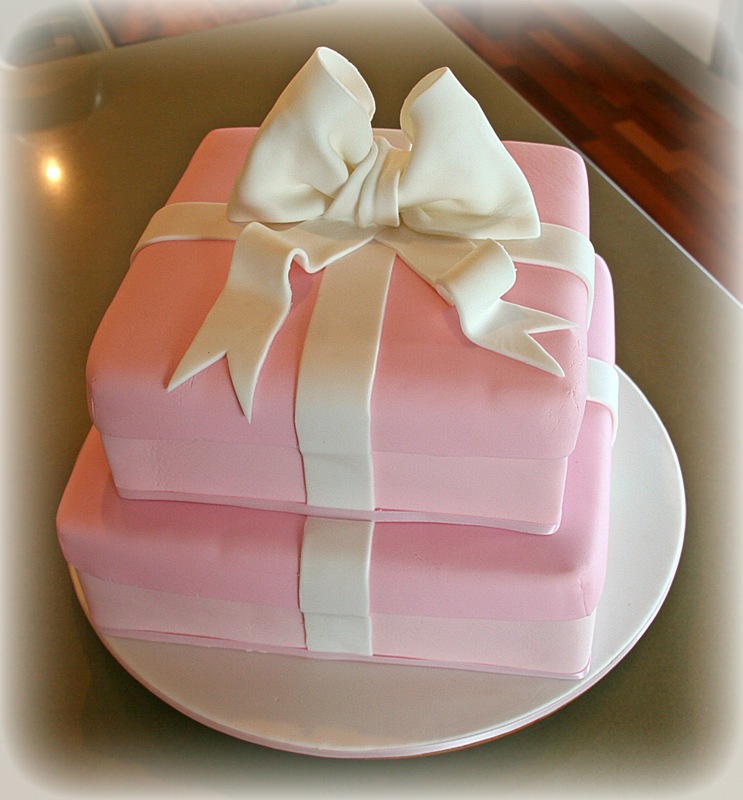 This cake was made up of two square tiers. The bottom tier was an 11″ dark chocolate mud cake with dark chocolate ganache and the top tier was a 9″ white chocolate mud cake with white chocolate ganache. Sift the flours together in a bowl. Add the sugar, a pinch of salt and make a well in the centre. Pour the chocolate mixture, egg and vanilla into the well then stir with a wooden spoon until well combined. Pour into the cake tin, Bake for 1 hour 45 minutes or until the cake is golden brown and a skewer comes out clean when poked into the middle of the cake. Cover with foil halfway through if the cake is browning too quickly. Preheat the oven to 160C. 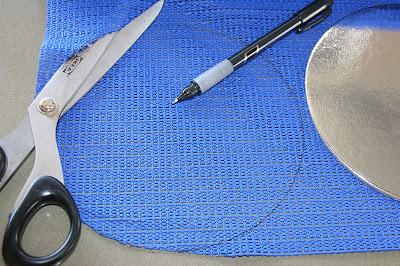 Grease the tin and line the base and sides with a collar that extends 2 cm above the top of the tin. 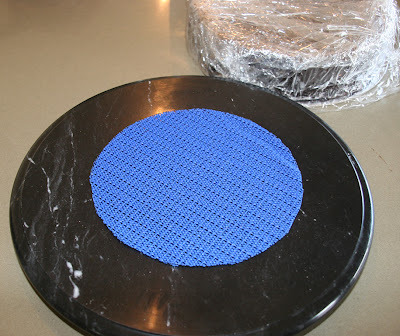 Add baking strips (made from damp cloths wrapped in tin foil) around the outside of the cake tin. Pour the mixture into the tin and bake for 2 hours (for 11.5″cake) or until a skewer poked into the centre of the cake comes out clean, though it may be a little sticky. Once removed from the oven, use a pastry brush (or similar) to brush the top of the cake with boiled water to keep it moist and save it from cracking and forming crusty bits on top. Then cover with a clean tea cloth to reduce evaporation. Repeat the brushing with boiled water step two or three times at half hour intervals as the cake cools. 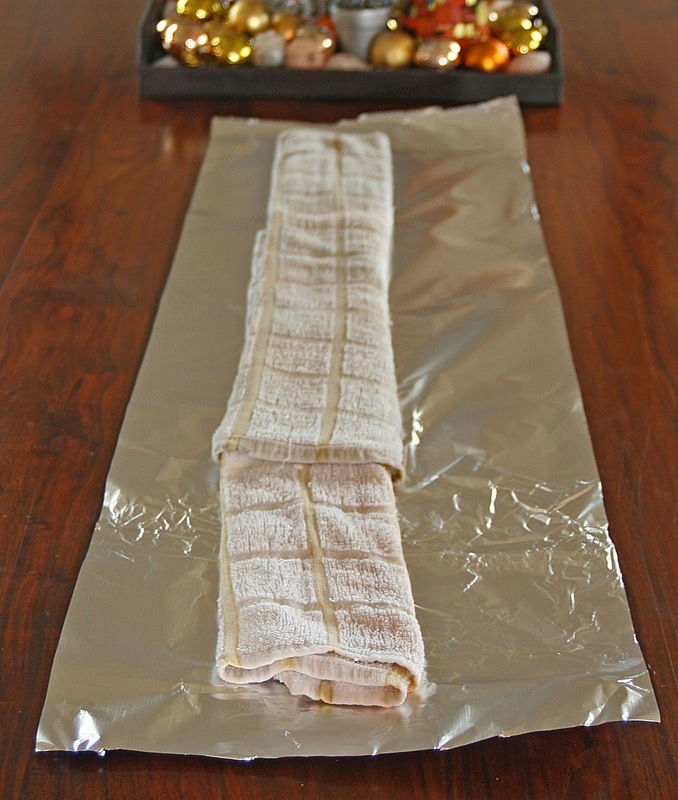 Remove the baking strips once they can be handled or use oven gloves to remove them. 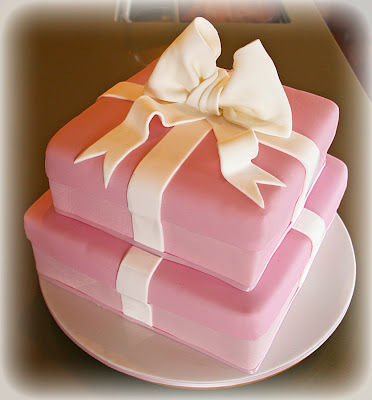 Let the cakes sit for a couple of hours to allow the icing to dry before you make the lids. Brush the top of the cakes with a little water (or syrup) and run the brush around the top inch of the side of the cakes. Knead 400g of the pink icing for the top box lid and 600g of pink for the the bottom box lid. Once the dough is pliable, roll out each piece till they are at least 8 in larger thad the width of each box. Roll the icing over your rolling pin, lift it up and roll it over the cake. Smooth the top and sides with a flexi-scraper. Use a ruler to mark the edge of the lid on all 4 sides. Trim the lid with a sharp knife. Knead 500g of the white sugar-paste to a pliable dough and roll out to 16 x 40 cm rectangle. Cut into 4 long 4 cm wide strips. 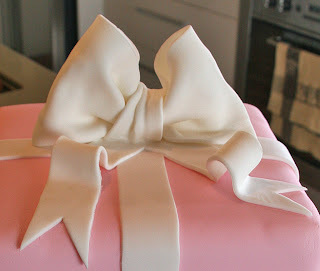 Trim one end of each ribbon into a point to help fit the ribbons together on top of the cake. Stick to the cake with water and trim excess ends with a knife. Instructions on making the bow can be found on this video. I love using ganache to cover cakes and wedding cakes as it tastes incredibly delicious and it’s so much easier to get nice, straight sides and edges compared to buttercream. 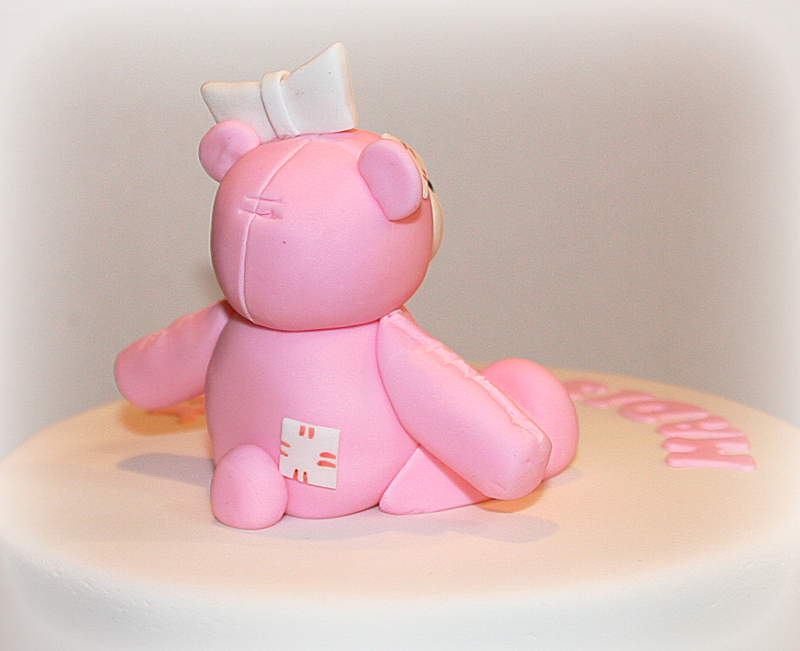 Ganache is also wonderful to use under sugar-paste for the same reasons. Living as I do on the Gold Coast, Australia, ganache is the obvious choice as it withstands most of our really hot weather MUCH better than buttercream. Chocolate and cream are the only two ingredients in ganache and are used in a 2:1 ratio for dark and semi-sweet chocolate and the 3:1 ratio for milk chocolate. 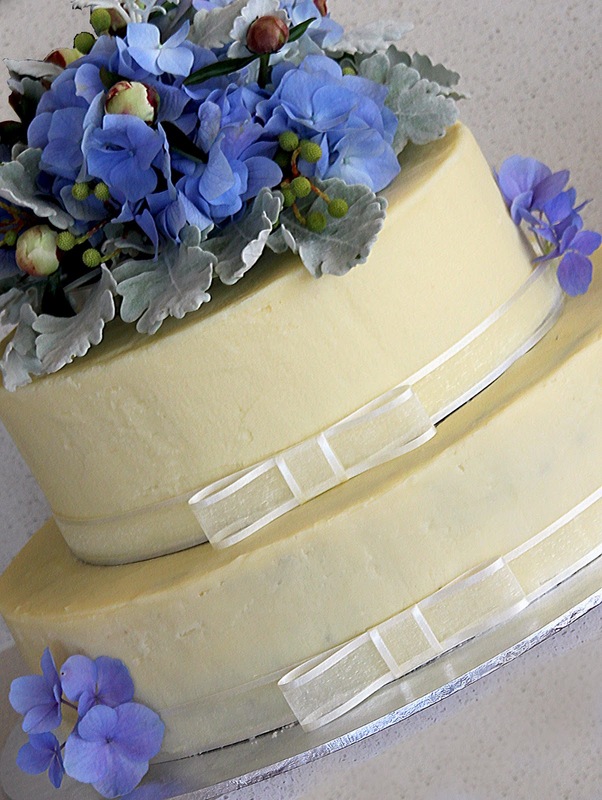 The wedding cake in the picture above was covered in white chocolate ganache using the ratio 3:1 i.e. 3 parts white chocolate to 1 part cream. In extremely warm weather it is sometimes necessary to increase the amount of chocolate in the mixture to prevent it melting. Step 1: Make the Ganache: Heat the cream until it just starts to bubble, pour over chocolate (which you have blitzed in the food processor to coffee granules size) and let it sit for about a minute to melt. Use a hand whisk to blend it all together then set aside to cool. Your ganache at this point will be thin. You will have to pop it in the fridge until it thickens to a slightly thicker peanut butter consistency (don’t cover because you might get condensation). It would usually set in the fridge in about an hour or two. If it sets too hard, just microwave it in 10 second intervals (keep mixing it whenever you take it out). 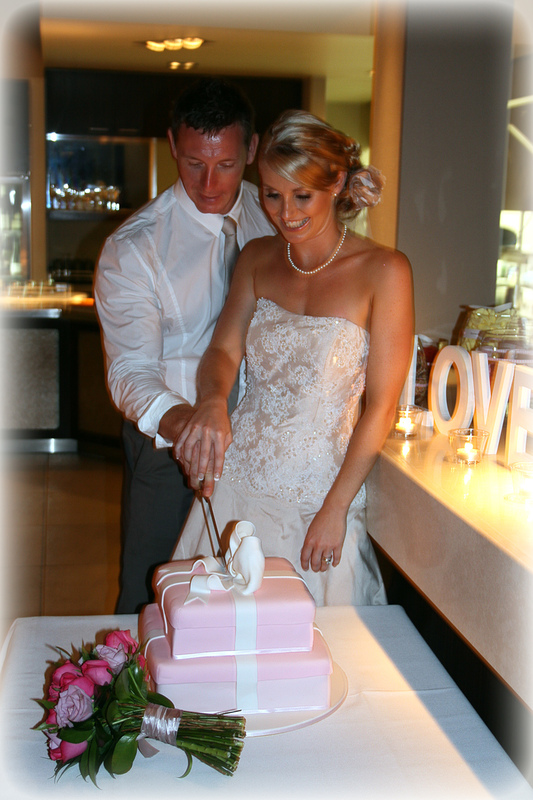 Cutting cake into layers. Keep original layer of greaseproof paper on as long as possible to keep cake intact add a board or metal base to the top of the cake when cutting as you may accidentally put pressure on the top of the cake when cutting and dent your nice flat top. 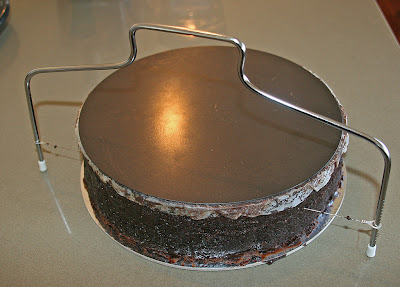 Step 2: Torte and level the 9″ cake: Place cake upside down on the cake board on a layer of ganache to act as a glue and to even out any irregularities. Add a mound of ganache in the middle of the board if your cake sunk or add a ring of ganache round the edge if you cake was high in the centre. If you are using the soft filling then pipe a ½” snake of Ganache around the outside edge of the cake to create a dam, pop the cake into the fridge for the dam to harden (about 5 min) remove from fridge, then fill with the filling. 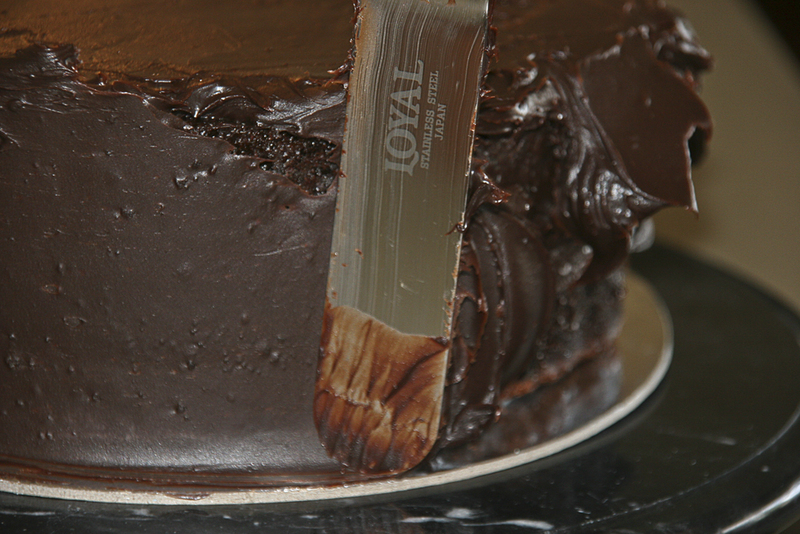 If using regular ganache to fill then apply with a cranked handled palette knife if you have one. Top with the next layer of cake and repeat if needed. Step 3: Crumb coat: (optional) Cover sides and top of cake quickly with a thin coat of ganache to stop crumbs getting into your final coat of ganache. This is useful especially if your cake is more crumbly than normal. Put in fridge for an hour or so to harden before continuing. 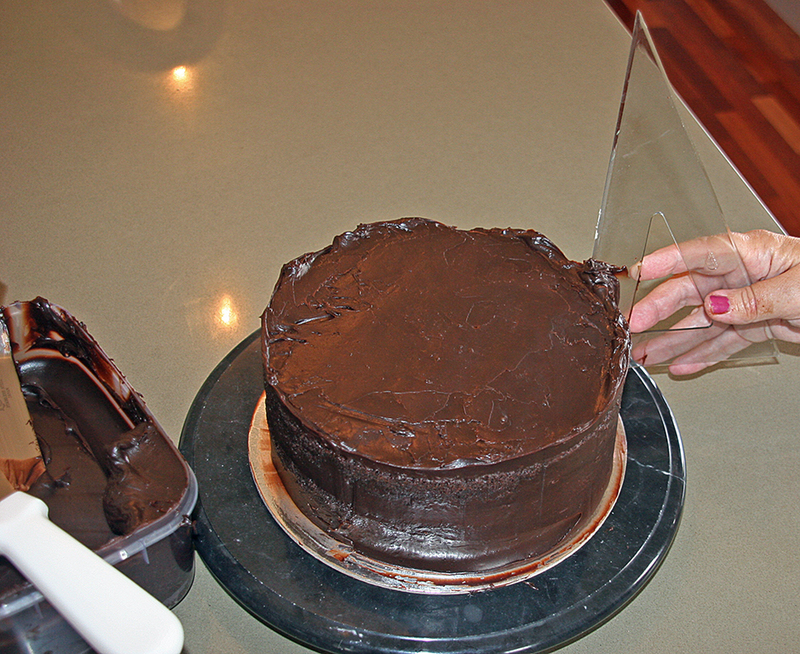 Step 4: Cover the top of the cake with Ganache: I like using the ‘double board’ method to get the top edge of the cake perfectly smooth. 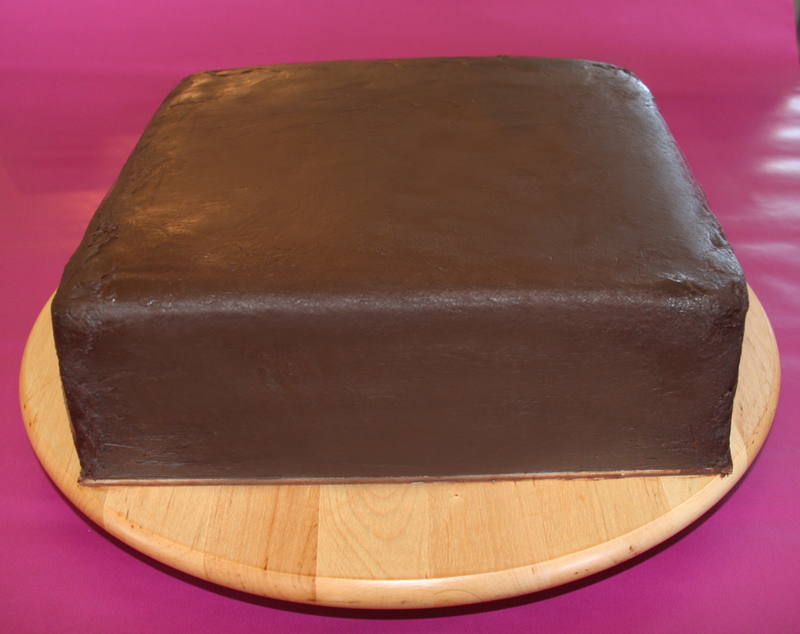 Top the cake with a 1/2” layer of Ganache, smooth it out then place a 9″ board on top which has been completely covered on both sides with cling film to keep the board clean and reusable and secured with sticky tape. Check with a small spirit level to see if it’s leveled, if not, gently press down around the cake until it is. Step 5: Cover the sides of the cake with Ganache: You want to always add more ganache than you need at the beginning because it is so much easier to just scrape off the excess and be done rather than to keep adding then scraping then adding then scraping…etc. As the 9” cake board is slightly larger than the cake (9” cake shrinks a little after cooling). I use the edge of the two boards as a guide to the thickness of the Ganache. 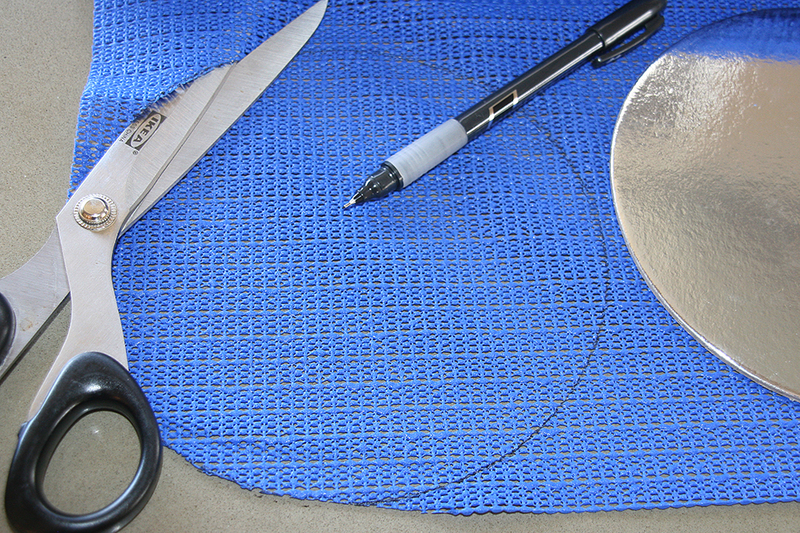 Once you have added the Ganache along the sides, use a metal scraper or similar tool, to scrape the excess off a little at a time, layer by layer as you turn the turntable. 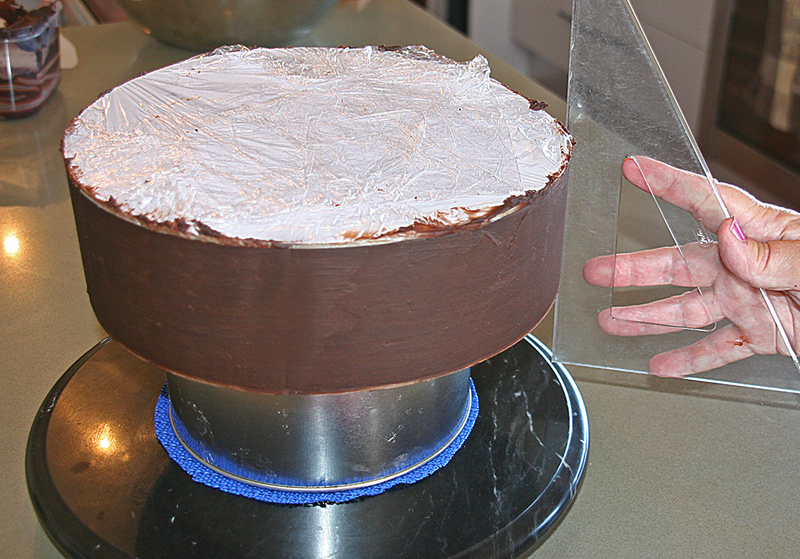 Step 6: Place the cake into the fridge for at least a ½ hour, remove, then carefully undo the cling and lift off the board then carefully peel the cling film from the top of the cake. 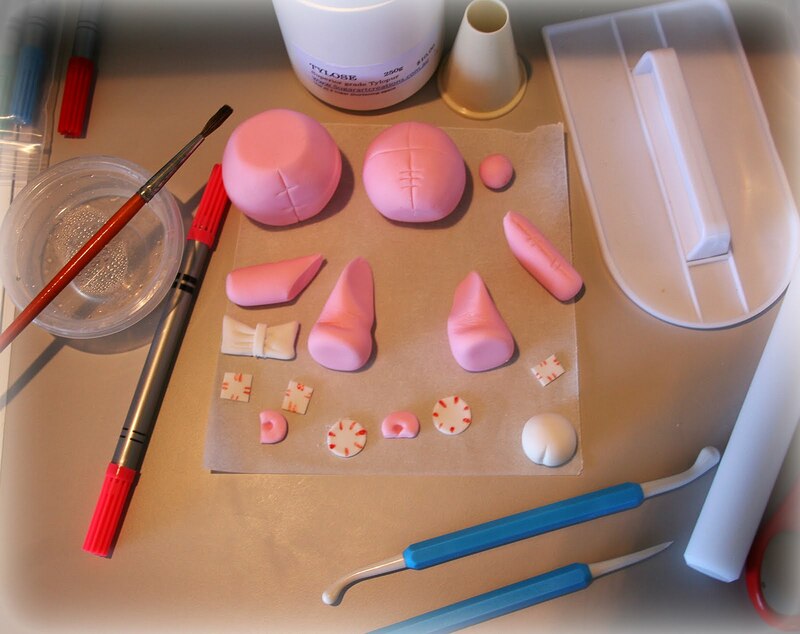 You may need to smooth away the little imperfections or fill any air holes with a little bit of Ganache. Step 7: Let the cake sit overnight at room temperature for the Ganache to completely set. If you live in a hot climate like I do then best to put it in the fridge overnight. A wine fridge is best (as it is not so cold as your normal fridge in the kitchen) and has a built in humidifier. The cake will get quite hard and cold overnight and it is important that the cake gets back to room temp before covering with sugar-paste. 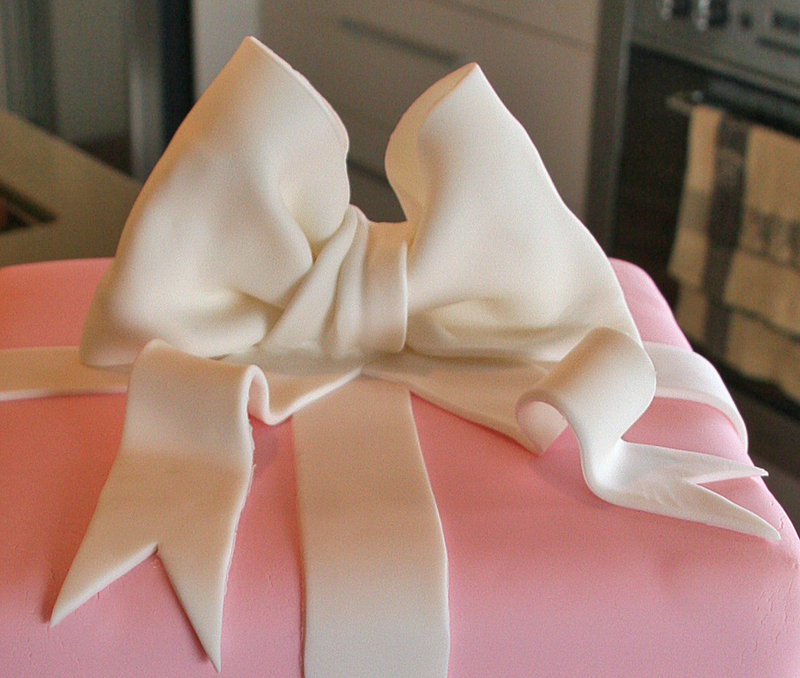 ( If you do not allow your cake to reach room temp, all the way through, the cake will sweat through your sugar-paste!) 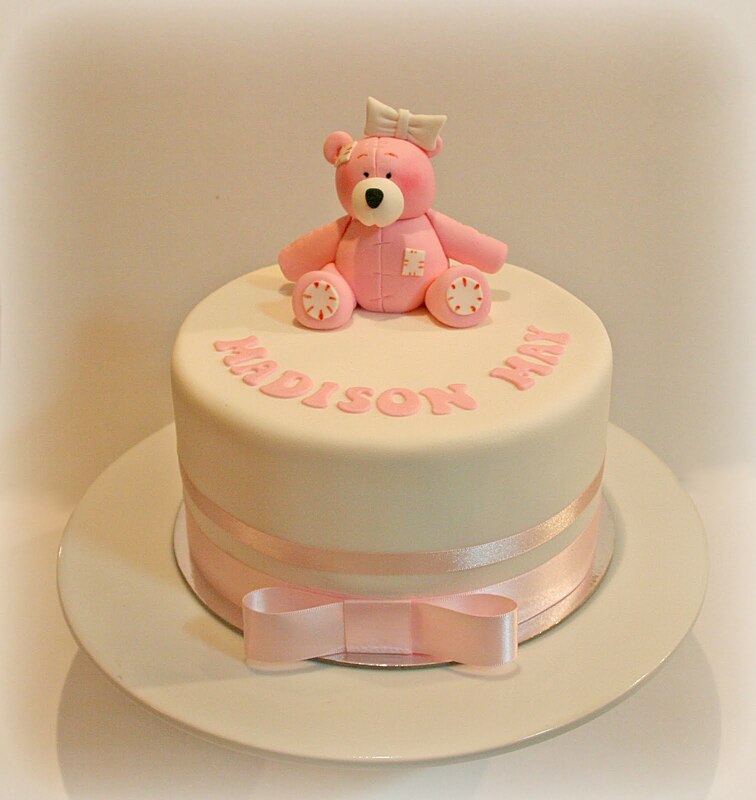 Before covering you can either brush or spray the cake with a little bit of water or vodka (it evaporates away anyways) or some type of syrup (apricot jam diluted with water). 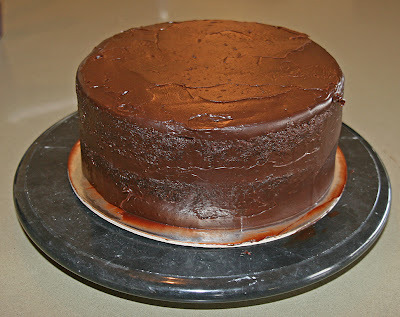 The above recipes make more ganache than is needed so that there is enough to allow for mistakes and for putting on extra and then scraping back off the excess. 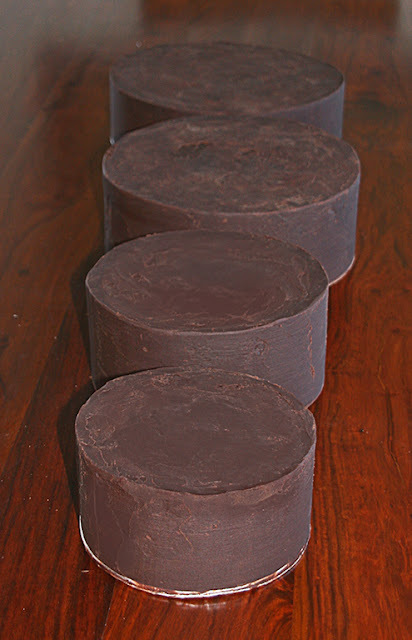 I also freeze any untouched ganache for my next cake.